Italian GP winner Sebastian Vettel will go on to win multiple drivers' world championships, says his team owner and ex-Formula One driver Gerhard Berger. The German, 21, became the youngest winner in F1 history with a composed drive in wet conditions at Monza. "He's bloody good," said Berger, winner of 10 Grands Prix. "As he proved today, he can win races, but he's going to win world championships. He's a cool guy." Vettel said: "It feels just great. It's difficult to put into words." The Toro Rosso driver, who has been dubbed "Baby Schumi" by the German media, was also praised by world championship leader Lewis Hamilton. "He's been fantastic all weekend," Hamilton said. "He's been getting stronger all year. "Having won today, it shows how good he is. It's great for him. It was easier for him without all the spray, but the pressure not to make a mistake was just the same, so congratulations to him." The first person to congratulate Vettel was double world champion Fernando Alonso, who he replaced as the youngest winner. 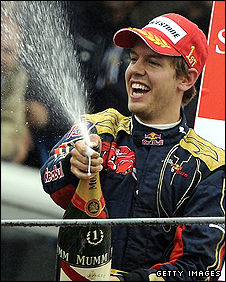 Vettel is 73 days younger than the Spaniard was when he won the 2003 Hungarian Grand Prix in a Renault. "For me, re-writing history or statistics is not that important," Vettel said. "It's maybe nice when you are older. The most important thing is winning the race. "It's difficult to describe," he added. "Being up there on the podium, seeing the crowd, my team, my family cheering, with tears in their eyes - this picture I will never forget. "Being here in Monza listening to my national anthem and the Italian national anthem. Winning here for an Italian team is probably the best thing that can happen to you as a driver." Vettel is a popular, talkative character with a strong sense of humour which, unlike many F1 drivers, he is not afraid to employ in his dealings with the media. A fan of Monty Python and the Beatles, he put in an impressively mature performance that won widespread praise within F1. But Alonso, who finished fourth in Monza, cautioned against expecting him to be able to continue his winning form. "We need to wait and see," Alonso said. "We don't need to put pressure on him. "He is young and we will see his talent in the next coming years. He needs to keep his focus on races." Alonso also went on to congratulate the Toro Rosso team on their first win - the Spaniard made his Grand Prix debut for them in their previous incarnation as Minardi in 2001. "I'm happy for him [Vettel] and also for Toro Rosso," Alonso said, "because I raced with Minardi and I know everybody there and they deserve it. It's a perfect weekend." Red Bull bought Minardi prior to the 2006 season and turned them into their junior team and Vettel is to switch to the senior team next year as partner to Australian Mark Webber. The team was founded by Italian Giancarlo Minardi in 1985 and their history has been one of struggling against the odds. Minardi became famous for giving future front-running drivers such as Alonso their first drive in F1, while Jarno Trulli and Giancarlo Fisichella are other former winners who started their career there. But they spent most of their time in F1 at the back of the grid and struggling for money and there have been several moments when they looked poised to go out of business. Red Bull bought them to use as a junior team in 2006 but until this year they had continued to founder at the back, despite using cars supplied by their parent team. This year Berger has made significant changes to the outfit, notably bringing in former McLaren and Ferrari engineer Giorgio Ascanelli as sporting director to work with team principal Franz Tost. Even allowing for the fact that they do not have to build or design their own cars, their 160-strong staff is tiny in F1 terms and the three men have won great admiration in the paddock for the way they have turned the team around. "It was difficult last year," said Vettel, who joined the team in the middle of 2007 after they sacked the American Scott Speed. "I did my debut for BMW Sauber and thanks to Franz Tost, Gerhard Berger and all the team and Red Bull. They gave me the trust and said we have a seat for you, take it. "From where we started last year the team, the mentality has changed so much. "Compared to BMW or McLaren-Mercedes or Ferrari we haven't that amount on manpower at home in the factory. "Obviously we get a lot of help from Red Bull Technology but still we have about 160 people working [in the factory in Faenza] and everyone today feels very special and can feel very special. I am one of them. We are a big team and I feel extremely happy." Red Bull chief technology officer Adrian Newey, who leads the design on the car the two teams use, told BBC Sport: "Last year, the team was very much Minardi and I don't think either [Vitantonio] Liuzzi or Speed did a fantastic job. "What they've done this year is shape it into a proper racing team combined with two good drivers. Toro Rosso have done a very good job of operating as a racing team." Newey, regarded as probably the finest racing car designer in the world, left McLaren at the end of 2005 to join Red Bull. And despite some encouraging performances from Toro Rosso in recent races, Newey said the victory, which was also the first for Red Bull, came as a surprise. "It's a real shock," he said. "I didn't think we could win a race this year - not from the front, anyway. "The weather played into our hands - the car is extremely good in the wet. If it had been a dry race we couldn't have won but the car's competitive in the wet and Sebastian did a fantastic job - he has looked extremely good all weekend. "It's fantastic - in terms of financial budget we're a lot smaller than the big teams so to put in a win against teams with those resources is great. "And of course we don't have the same infrastructure as them, either. So we have had to work hard to get that up to scratch. That takes some effort away from the resources as well."